Astrobiology is the multidisciplinary field of science engaged in the search for life beyond Earth. Our planetary neighbour, Mars, shows extensive evidence for a habitable environment conducive to the origin and persistence of life early in the planet’s history. Mars has, however, since suffered an environmental collapse: the planet today is very cold and dry, and the lack of magnetic field or substantial atmosphere means the surface is bathed in harmful ultraviolet and cosmic radiation. The question, therefore, is what evidence of past or present martian microorganisms might remain on or near the surface to be detectable by our future exploration rovers? Hardy, ‘extremophile’ microbes surviving in environments on Earth that are similar to martian conditions, known as martian analogue sites, inform us about the survival limits of life and how best to search for trace signs of microbial colonists. This PhD project will work with samples from a range of such martian analogue sites around the world, as well as extremophiles cultured from them, and analyse their detectable biosignatures using a suite of spectroscopic techniques such as Raman spectroscopy, FTIR (Fourier-transform Infrared) spectroscopy, and fluorescence spectroscopy. 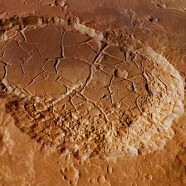 Such spectroscopic instruments have the advantage of offering rapid, non-destructive analyses, revealing information on both the mineralogy and biosignatures within a sample, and so have been proposed or are confirmed for upcoming planetary exploration missions, including the European Space Agency’s ExoMars 2020 rover and NASA’s Mars 2020 rover. Just as important as characterising what biosignatures we might anticipate to be present on the martian surface from extremophile microbes, is understanding how well these signs will persist in the harsh martian environment. Over what timeframe will detectable biosignatures be destroyed? Can we still recognise unambiguous signs of life even after they have been partially degraded? The second half of this PhD project will therefore study changes to the spectroscopic biosignatures with exposure experiments. The student will take part in the University Graduate School and Faculty Doctoral Research Development Programme; in addition to these training programmes and the subject specific skills listed above, the student will gain important transferable skills (e.g. presentation skills, scientific writing and employability skills) to aid in future career progression. A number of full-time Studentships are available, to candidates with Home fee status in the Faculty of Science and Technology starting in September 2017. Dartnell, L.R. et al. “Destruction of Raman Biosignatures by Ionising Radiation and the Implications for Life-Detection on Mars.” Analytical and Bioanalytical Chemistry 403.1 (2012): 131–144. Preston, L.J. et al. “Fourier Transform Infrared Spectral Detection of Life in Polar Subsurface Environments and Its Application to Mars Exploration.” Applied Spectroscopy 69.9 (2015): 1059–1065.